« Did Deforestation Spring Zika? There are, however, exceptions. Some adults appear to suffer from Guillain-Barré, which is an autoimmune disease—an inflammation of peripheral nerves leading to progressive weakness in the arms and legs. Even as soon as a few days after infection patients can begin to progress from a tingling sensation in their limbs to paralysis. Many recover. But the big deal, the disease expression striking fear in our hearts, however misguided, engenders a kind of Children of Men dread. 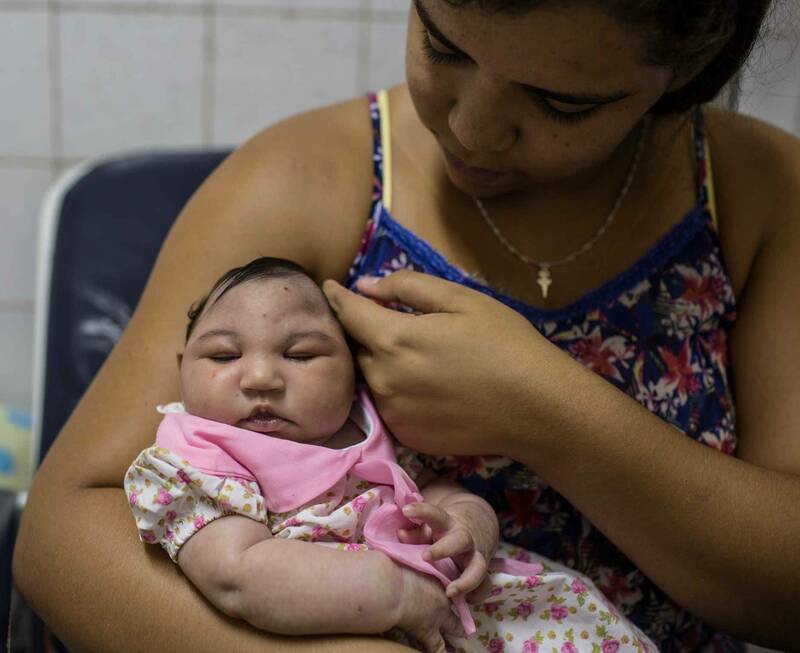 A startling proportion of pregnant women infected with Zika in Brazil have given birth to babies with microcephaly. The infants are born with abnormally small skulls, with definitional impact on brain development. Babies of mothers who are infected by Zika in their first tri-semester appear most frequently affected, but there have been cases of mothers infected later in their pregnancies giving birth to microcephalic children. Many of these infants are also suffering damage to their optic nerves, perhaps leading to blindness, although it’s still early yet in confirming the presentation. Babies who dodge microcephaly may still suffer perinatal impacts, including, along the lines of the aftereffects of rubella, “A.D.H.D., autism, epilepsy and schizophrenia,” although at this point the contention is largely conjecture. The connection between Zika and microcephaly isn’t quite a done deal. The molecular data are still rolling in and a model of pathogenesis, although increasingly convincing, is as yet incomplete. As well as the [full] Zika genome [found in a child’s brain], the researchers found high levels of viral RNA and viral particles in brain cells. There was no evidence of the presence of other pathogens that could have caused the brain damage, and no other organs were damaged suggesting the virus preferentially attacks the brain. Zika virus RNA [also] has been found in the amniotic fluid of two women whose unborn babies were diagnosed with microcephaly by ultrasound in Brazil. It has also been identified in blood and tissue samples, including from the brain and placenta, in babies who were miscarried or died soon after birth, and in spinal fluid from surviving babies with the condition. We need to demonstrate what happens when someone has the virus, so we need to identify and follow women from pregnancy through to birth through well-designed studies that compare those that do and those that don’t get infected. We also need to rule out any other possible causes, such as cytomegalovirus or rubella, and identify all influencing factors, such as whether the stage of pregnancy affects outcomes. The surveillance data that first sounded the alert meanwhile continue to bounce about. From October 2015 to January of this year, that’s four months, almost 4,000 cases of babies born with microcephaly accumulated in Brazil, mostly in the coastal states of the northeast, while typically there are just 150 cases per year for the whole country. In early February, Brazil announced it could connect certifiable Zika cases to only around 400 out of the thousand-plus microcephalic infants health officials reexamined. Is the unexplained variance attributable to the go-to placeholder of “genetic factors,” as officials offered, or something else entirely? Colombia meanwhile reports no microcephaly among two thousand Zika-infected pregnancies. On the other hand, it’s early yet with few of those embryos to term. [T]his larvicide is a juvenile hormone analogue or juvenoid, whose mechanism of action inhibiting the development the insect adult characteristics (eg, wings, maturation of the reproductive organs and external genitalia), keeping it with “immature” aspect (nymph or larva), that acts on endocrine disruption and is teratogenic and inhibits the formation of the adult insect. George Dimech, the director of Disease Control in the Health Department of Pernambuco, a microcephaly epicenter, declared no human study showed pyriproxyfen genotoxic, a declaration repeated by international scientists, pointing out insect and mammalian developmental pathways are orthogonal. The latter claim, however, isn’t a prima facie explanation, with many pesticides discontinued because of their effects on mammals. Indeed, that ontogeny may be polyphyletic doesn’t mean biochemistry can’t be convergent or conserved even across such a deep phylogenetic gap. And divergent physiologies don’t mean toxicity can’t be pleiotropic, damaging insects one way, mammals another. For the record, we should note one 2005 study showed pyriproxyfen had estrogenic effects upon in vitro lines of human ovarian carcinoma cells transfected with an estrogen-responsive luciferase. The effect was augmented more than twice over when used in combination with prothiofos, another pesticide. Oncologist and critic of alternative medicine David Gorski meanwhile points out there isn’t a detrimental outcome in the world of health anti-vaxxers can’t blame on vaccines, in this case the Tdap vaccine against diphtheria, pertussis, and tetanus, also introduced in Brazil in 2014. And by some Rube Goldberg mechanism involving livestock tetracycline, a fringe blames genetically modified autocidal mosquitoes bred to sterilize local populations of mosquitoes. [Matt] Miller and [Jose] Loaiza’s modeling points to the possibility that Asian tiger mosquitoes could replace A. aegypti in areas where GM programs have killed off the local population of other species. Evidence from the southeastern U.S. suggests that’s what happened when Asian tiger mosquitoes invaded the area. They also suggest that wild A. aegypti populations from elsewhere might be able to reinvade these areas themselves. Either scenario could aid the spread of chikungunya in Panama and facilitate future outbreaks of dengue. “In this particular case, where you’ve got two mosquitoes that can do the same thing, but the GM approach is only going to affect one of them, it doesn’t make sense at all,” says Miller. In typical fashion, the New York Times machine-guns all such alternatives to the official story—from the ridiculous to the serious—without addressing the holes in the official paradigm. It’s a confirmation by negation, a guilt by disassociation at which the bourgeois press repeatedly excels. Indeed, even if, as it is looking, Zika is causing this particular burst of microcephaly, focusing on the virus alone, as is the biomedical wont, may be as absurd as any conspiracy theory Gorski debunks. ABRASCO’s allusion to pyriproxyfen was made only in passing to the bigger point that over forty years of pesticide campaigns have been met with abject failure. Much of ABRASCO’s statement orbited the economic austerity—in sanitation, housing, and health services—driving the collapse in mosquito control. Intentionally dealt or not, the wonkery counterpunch ABRASCO took serves as an attempt to delegitimize the doctors’ broader critique. After all, if not vaccines and engineered mosquitoes, how are we to intervene? What, that is to ask, is missing? We might take another step back and parse through more of the probative evidence. As we touched along the way, Zika is vector-borne. The virus is transmitted by mosquitoes—flying hypodermic needles—in this case of the Aedes group. The taxon was eradicated in Brazil in the 1950s but, as ABRASCO noted, has since roared back in the face of the petrochemical program. That is, in this case, Zika isn’t generally transmitted directly human to human, although there appear a few cases of sexual transmission and, obviously, vertical transmission mother-to-child. Arboviruses are rarely deterministic in their modes of infection and clinical outcomes. Exceptions are routine. Multiple pathways are the norm. Some, such as dengue and chikungunya, no longer depend upon enzootic amplification by some animal reservoir, now spreading by mosquito directly between human populations. The immediate concern is that as travelers return back to their home countries, Zika will infiltrate local populations of mosquitoes, expanding the viruses’ geographic extent, potentially enlarged by an equatorial band broadened by climate change. So that’s where we stand now: an expanding geography for a virus with a previously unrecognized and for some parents an emotionally devastating effect on newborns. Disconcerting too are the mysteries as yet still unsolved. As we noted, does Zika really cause microcephaly? What are the mechanisms by which Zika causes the various nervous system syndromes we described? Are these associations more than epidemiological? Can we stop Zika’s spread? All such questions are important, but emergency considerations alone, however critical, can trick us into losing the forest for the trees. Confusing proximate etiologies for causality is the trap around which a small but growing group of scientists parts ways with their colleagues. The best way to introduce that difference in this context is to begin with Zika’s history. While Zika’s emergence is idiosyncratic, specific to the virus’s unique evolutionary history, it is also typical of many a disease. Zika is named after the Ugandan forest in which the virus was first characterized in 1947. The virus subsequently made its way across the equatorial belt to Southeast Asia. In 2014, it made its way to French Polynesia and reached Brazil last year, which researchers have noted coincided with both the World Cup and the Va’a World Sprint Championship canoe race when thousands of fans from around the world convened. Phylogenetic analysis confirms the Brazilian strain is Polynesian in origin. The virus was first isolated back in 1947 in the Aedes africanus species of mosquito. As public health physician Amy Vittor describes, Aedes africanus is the forest relative of Aedes aegypti and Aedes albopictus, both of which can spread Zika. The latter mosquitoes are more associated with areas disturbed by deforestation—by logging, mining, and monoculture crops. They are also associated with exurbanization, with the urban edge creeping deep into the forest that remains. So, as for dengue and chikungunya, also carried by these mosquitoes, the ecotypic shift Zika has undertaken—from forest to farm and city—is intimately related to anthropogenic impact. That isn’t news. Many a commentator in recent weeks has made such a connection, as they should, often folding in the effects of climate change. As our climate warms up, mosquito biogeography expands toward the poles. What hasn’t been discussed are the factors driving such environmental destruction. There is a political economy of research that rewards addressing ecohealth but, in an explicit omission, leaves out the sources of capital driving the resulting damage. Neoliberal development, a kind of globalized laissez faire, has monetized both the last of the world’s primary forests and the subsistence agroforestry on which millions of smallholder farmers depend. Multinationals want that land and, backed by big finance, are expropriating it in the hundreds of thousands of hectares. We’re talking sovereign wealth funds, state-owned enterprises, and governments, but also private equity in the form of agribusiness and agrifood companies, biofuel developers, and private institutional investors–mutual funds, banks, pension funds, hedge funds, university endowments, and private equity funds—all land grabbing, all accelerating deforestation and development. With real world consequences upon the resulting epidemiologies. From that perspective, it isn’t just Brazil or Sub-Saharan Africa upon which we need to focus our epidemiological eyes. We could also characterize New York, London, and Hong Kong, among other sources of capital paying for deforestation, as some of the world’s worst disease ‘hot spots’. It’s a refutable hypothesis the testing of which no science agency or private foundation, many backed by the private equity driving deforestation, will likely fund. My colleagues and I hypothesized Ebola in West Africa emerged by just such a mechanism. As Guinea tilts toward the kind of open market forestry its neighbor Liberia has practiced for decades, a threshold of deforestation appears to have stripped the Guinée forestière of its capacity to keep Ebola from accumulating the momentum it needed to make it out as a regional outbreak. Neotropical forests are complicated environments marked by complex ecological webs of pathogens and hosts, prey and predators, competitors, mutualists, among other functional relationships. Most pathogens rarely get the chance to line up enough susceptible hosts into the chain of transmission they need to make it out of the forest. There’s a kind of inbuilt environmental inertia that cushions outbreaks. For Ebola, a gorilla troop or a human village or two every couple of years suffers a spillover event—a terrible thing—but the outbreak doesn’t make it farther. When forests are stripped out by logging and monoculture crops, most pathogens die out along with their hosts. But other strains hit the jackpot. These bugs are no longer constrained by the forest ecosystem and their hosts adjust to the new opportunity. Birds, bats, and monkeys, for instance, are behaviorally plastic and quite capable of taking advantage of unforeseen circumstances. Frugivore bats, for instance, are attracted to monoculture palm oil. What’s not to like? There’s food, shelter, expansive flyways, and few, if any, predators. My colleagues and I proposed such a shift expanded the interface between bats and humans and increased the odds an Ebola spillover event with some epidemiological legs would occur. It turns out this is exactly the line of thinking long-term researchers have converged on for the Zika outbreak, even as many refuse to name neoliberal names. provided a much more suitable environment for the malaria mosquito carrier than pristine forest. Increasing urbanization and poverty create a fertile environment for the mosquitoes that spread dengue by creating ample breeding sites. In addition, climate change may raise the temperature and/or humidity in areas that previously have been below the threshold required for the mosquitoes to thrive…Urbanization, changing climate, air travel and transportation, and waxing and waning control efforts that are at the mercy of economic and political factors have led to these mosquitoes spreading to new areas and coming back in areas where they had previously been eradicated. Much work has shown urbanized pockets of poverty terrific breeding sites for mosquitoes, with, as ABRASCO pointed out, poor sanitation, poor drainage, and standing water. Structurally adjustment has degraded surveillance efforts and ended many a control effort, permitting mosquitoes free range. All factors that emerge out of the heart of the neoliberal program. There is reason to believe that additional viruses such as [Venezuelan equine encephalitis virus], [Zika virus] and [Mayaro virus] have the potential for urbanization, which could have devastating public health consequences, especially in the Western Hemisphere, where there is no herd immunity. The movement of rural Aedes and Culex vectors and their hosts into urban and peridomestic environments allow effective amplification within simplified transmission cycles in close proximity to humans. The tropical urbanization that has accelerated since World War II, combined with the multiple interhemispheric introductions of both Ae. aegypti and Ae. albopictus, has greatly increased the population densities and geographic ranges of these vectors. Ae. aegypti is especially aided by poverty when the lack of municipal water services results in intradomiciliary water storage and the lack of trash collection results in the accumulation of waste receptacles that hold rainwater to support larval development. After a hundred years plus of social geographies of vector-borne diseases, the role poverty plays is at this point a veritable law, even as the specifics differ place-to-place. But ‘poverty’ can serve as a liberal’s epistemic cover, naming a problem its perpetrators aim to circumvent. Other research has addressed the expropriation driving arboviruses in a more explicit fashion. Deforestation has also been long recognized as one of the major drivers for the emergence of infectious diseases affecting humans, with studies documenting the emergence of malaria, leishmaniasis and Yellow fever shortly after large scale land use changes. An additional insight from the study of the association between malaria emergence and deforestation was the correlation of malaria endemicity with the formation of latifundia, i.e., the accumulation of land tenure by a small number of landowners, a pattern observed both in the Agro-Pontino Romano for centuries, and Spain during the 1930s. More specifically, it has been suggested, and documented, by the long historical records for the Roman Agro-Pontino, that deforestation and agricultural development led to ideal conditions for the development of mosquito vectors of malaria parasites, a fact biologically instantiated by ecological research over recent years. The debilitating effects of malaria on farmers reduce their ability to harvest crops and lead to the sale or abandonment and adjudication of land by healthier and/or wealthier landowners that will underutilize land as latifundia, i.e., large states whose exploitation, because of the landmass size, require the labor of workers who do not own the land. When land cover is primarily forested, land tenure can be redistributed for agricultural exploitation, and in turn result in a repeated cycle of agricultural exploitation, malaria transmission and latifundia formation. In short, as we have discussed elsewhere, the latifundia model, and its neoliberal analogs, can promote disease emergence, while, in the other direction, disease outbreaks can drive the very consolidation that selected for them. In essence, pathogens are indirectly used as bioeconomic weapons by which to initiate new rounds of land grabbing. A highly unstable system of positive reinforcement, nigh on now a colonial cliché. It would appear Che Guevara, who toured across the open veins of Latin America offering medical assistance to communities least able to afford it, was only one of a long line of continental doctors and public health practitioners who to this day are radicalized by memories of such imperial fire. Yale’s Durland Fish argues that we have to pay much more attention to how large projects involving forests, dams, wetlands and more change the ecology of diseases by changing the habitats of their vectors. And that we need to think about diseases from a much more ecological standpoint in general. Contrary to the established view, living close to the forest edge can diminish the risk provided other factors are taken into account. Additionally, differences in vulnerability to climatic variability appear to interact with forest cover to influence risk across counties where the disease has its largest burden. Incidence exacerbation associated with El Niño Southern Oscillation is observed in counties with larger proportions of deforestation. [The] risk of infection is diminished among those living close to forests, an unexpected pattern in light of previous studies on the role of this habitat type. The pathway by which social marginalization promotes transmission of Leishmania in this context probably is linked to a major environmental problem affecting the tropics: destruction of forests and associated biodiversity. Changes in biodiversity due to deforestation are probably of importance to ACL since the major reservoirs of Leishmania species are small mammals, including marsupials, rodents and sloths. Forest fragmentation has been shown to increase densities of these species, because in small and isolated habitat fragments, large predators are lost first, leading to major changes in inter-specific interactions that decrease mammal biodiversity and lead to the dominance of rodents. Despite the idiosyncratic differences across disease and locale, the canonical juxtapositioning of captial’s spatial fixes, land grabs, deforestation, and disease emergence begs examination of northeastern Brazil where it appears Zika established its Latin American beachhead. By nearly every indicator, western Bahia is a quintessential neoliberal frontier. Soy area increased from nil in the late 1970s to 400 000 ha in 1988. By 1991, 182 central-pivot irrigation plots were in operation, and there would be more than 600 central-pivots by 2005. Farmers are strongly oriented toward export markets for soy, cotton, coffee, and fruit crops… Beginning around 2000, the government of Bahia extended modest subsidies for cotton and irrigated coffee and fruit—mainly infrastructure cost-sharing, value-added tax discounts, and rebates on finance charges for large projects. Farms are large, usually exceeding 1000 ha; single landholdings in excess of 5000 ha are common…Likely causes for Cerrado clearing include favorable agronomic, policy, and market conditions for cotton cultivation, strong regional demand by soy crushers for wood fuel (from Cerrado or Eucalyptus), and the search for greater economies of scale among individual farmers by increasing cultivated area. On the other hand, a shift in mosquito community ecology on the heavily populated coast was reported in 2000, with the arrival of Aedes albopictus in the native rain forests of Recife, the urban epicenter for microcephaly, in what would be the heavily hit state of Pernambuco. Albopictus would in the decade to come be followed by Aedes aegypti, Culex quinquefasciatus, and what were for researchers a surprising variety of other species, reported carriers of filariasis, dengue, Rocio, Mayro virus, and yellow fever. The literature around neoliberalism’s impact upon even Pernambuco alone is huge–on its effects on local education, health, sanitation, agriculture, and elsewhere across social organization. Rebeca Maria Aguiar do Nascimento and Edvaldo Carlos Lima, for instance, characterize the problems of privatizing local land for biofuels. The substantial difference between the three [Partido dos Trabalhadores] administrations showed not only a lack of institutional [support] for the sector that seemed to [operate] according to the local electoral cycles and their alliances, but also [in] the contradiction existing in populist rhetoric characteristic of PT governments, where the element of social participation that should be included as one of the pillars of their governments is just a backdrop, [while] inside the bureaucracies, without any form of inclusion in decision-making processes, in the case of Recife has led to a process of privatization of services. I’m at a language barrier, but I have friends and colleagues on the case. In the coming weeks, together we’ll learn more of the means by which neoliberalism shaped transitions in epicenter land use and epizoology. For now, let us propose a working hypothesis that even as Zika arrived from abroad–and pathogens traverse the globe everyday–it found in northeastern Brazil a consummate niche for amplification. Cutbacks in mosquito control expenditures, as ABRASCO described, are pursued in the context of global climate change, continuing deforestation, neoliberal privatization, and latifunda-led land consolidation. By logging, mining, and intensive agriculture deep into the forest, capital-led extraction depresses long-term ecosystemic controls, permitting previously marginalized hosts and the pathogens they carry regional and potentially pandemic escape. On the other end, structural adjustment truncates public and animal health, softening herd immunity for newly arrived diseases and resurgent standbys. Any comprehensive effort to respond to Zika and other vector-borne diseases need explicitly reverse these processes. Vaccine developers made clear that a [Zika] vaccine for widespread public use is at least months, if not years, away. This entry was posted on February 26, 2016 at 1:34 am and is filed under Ecological resilience, Evolution with tags ABRASCO, Amy Vittor, Angelo Celli, Bahia, bioeconomic, Brazil, Children of Men, deforestation, Ebola, expropriation, latifundia, leishmaniasis, Luis Fernando Chaves, microcephaly, mosquito, neoliberalism, Pernambuco, pyriproxyfen, Zika. You can follow any responses to this entry through the RSS 2.0 feed. You can leave a response, or trackback from your own site. Thank you for an interesting take on the Zika situation, and the limitiations of the current explanations bandied about. Definitely agree that an ecological perspective is highly useful! Thank you for the kind words, Gustaf, really. Let me add that I see it more as ecology-plus. Indeed, the favored Lotka-Volterra and Kermack-McKendrick formalisms in our field may miss the point. Perhaps pathogens aren’t merely natural populations growing as they will. Indeed, my colleagues and I have switched to control theory as a way to more explicitly account for the socioeconomic context imposed on (or loosened from) that growth.